Whether you are looking for a guitar amp kit for performances, jamming with friends or solo practice sessions in your home studio, it is important to lay down at the outset the functionalities and the capabilities of the unit that you will purchase. A feature-packed guitar amp kit with a wide selection of sounds and tones will be quite effective for one guitar player, but will not work to its fullest potential for another player. It goes without saying that the guitar amp should match your capabilities, and getting one that does not meet your expectations will be a great letdown and a waste of money. There are many guitar amplifiers in the market that are very affordable and give good value for the investment that you put into them. An expensive guitar amp kit with a wide range of playing possibilities is quite desirable to most guitarists, but you have to be practical when choosing one for your personal use, especially when you have to allot a certain chunk of your budget to its purchase. Buying wisely based on your needs is best and you will most likely find that the capabilities of some budget-friendly guitar amp kits will suffice for your current needs. There are various types of guitar amps to choose from, and the most appropriate one depends on the use you intend to put it through, whether it is for practice, jamming or performances. Solid state amps are reliable and durably-built and seldom require repairs. The tones are clean and there are good possibilities for distortion. These amps are best for practicing and for touring. Modeling amps provide a selection of presets that were developed using digital processors to emulate great sounds. The built-in digital effects are good over a wide range of genres to give your music a distinctive, personal touch. Some guitarists go for tube amp because of their warm tones and organic distortions, with separate channels for clean and distorted tones. One of the most important factors when choosing a guitar amp is your budget, though functionality should not be sacrificed because of cost. The more expensive models are worth the extra money but there are budget-friendly models that give good value and excellent sound quality for practices and performances. It is worthwhile to consider the construction of the guitar amp to ensure that you get good quality sound. Thinner wood can cause the speaker to vibrate, while opting for a closed back or an open back is a personal choice that depends on the type of guitar you use. Other notable features to watch out for are the number of channels, speaker size and built-in effects. Power. The price of the guitar amp kit is directly proportional to its power rating and the size of the speaker. Guitar amp kits equipped with bigger speakers that run on 100 watts or more that are suitable for playing in big venues can be very expensive and at the same time can be heavy and cumbersome when you are always on the road. For practice sessions and playing in small venues, guitar amps featuring low power of 10 – 30 watts and small speakers that range in size from 6 to 10 inches can be more practical. Versatility. There are amp kits that are suitable for all-around purposes, from practice sessions, jamming, amateur recording and performances. Other features to look for that is quite important to many players are the built-in effects, channel switching, effects loops and programmable capabilities. Portability. 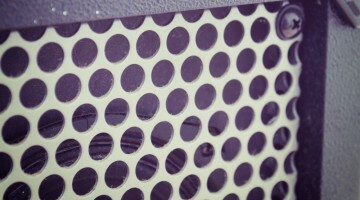 The construction and design of the guitar amp kit is worth noting when you plan to use it outside of your home studio. Taking it with you on the road to performances means you have to consider arrangements for transport and should also consider the weight, durability and ruggedness of the amp. The Fender Mustang I V2 20-Watt 1×8-Inch Combo Electric Guitar Amplifier is a solid-state amp with dual channels for clean and mean guitar playing. This classic-looking amp with the black bronco vinyl covering with silver grille cloth and a black angled front panel is well-built and sturdy. You can use it for practice and recording in your home studio, or you can ake it with you in your performances and special events. Dual channel – This feature allows you to switch from clean to mean guitar playing with the selectable amp voices. Switching from one channel to another is easily done through a footswitch with no interruption to your guitar playing, which is important during performances. You can choose from a wide array of tonal varieties from the clean tones of the Twin Reverb or opt for Jazz, British, Metal or Blackface. Great selection of amp voices and effects – This feature is useful for guitarists who want to experiment playing in different genres such as jazz, metal, rock, country and blues. You can easily dial in the amp voicing and practice with different effects to spice up your music. You can use the tap tempo button and a mix knob to control the parameters and obtain the correct tone that you want. 100 watts power and two 12-inch speakers – The two Fender special design speakers and 100-watt power provides the volume desired by many guitarists. It can drown out competing sounds to make you stand out and put your music across to a crowd. Versatility – The dual channel amp for clean and mean tones in combination with the special effects such as delay and digital reverb enable guitarists to explore many usable combinations. With its portability and rugged build, you can use the amp for practice in your home studio or take it with you to special events and performances. Easy to use – There are two options for mixing and adjusting tones, a tap tempo button and a mix knob. In addition, the footswitch is a convenient feature that allows you to change from one channel to another without interrupting your music. Each of the two channels has a 3-band EQ for independently dialing-in your tone. Powerful – The 100-watt guitar amp combined with the two 12-inch Fender special design speakers will make your guitar stand out from the rest. The solid-state amp can be easily affected by electrical signals coming from other electrical tools or powerful neon lights, so it is advisable to have a power conditioner when performing in bars or unknown venues. The Fender Champion 100 is a versatile and articulate solid state amp that combines affordability with functionality and its versatility in achieving tones across different genres is excellent. The Fender Mustang I V2 20-Watt 1×8-Inch Combo Electric Guitar Amplifier is a versatile, great-sounding amp with 17 models to choose from, which at the same time allows you to build up a number of customized presets using the FUSE software. It is lightweight and portable and is ideal for private practice and small gigs. Fender FUSE software – The FUSE software adds more to the feature-packed amp, allowing you to slowly build-up your own library of presets to highlight your playing style. 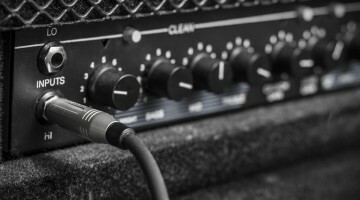 Once you have created and saved these, you can unplug the guitar amp from the computer and use your customized presets in your gigs or practice sessions with other musicians. 17 amp models, including digital effects – This feature allow guitarists to play in different genres without having to build presets. The digital effects that include tremolo, reverb, delay/ echo and many more add richer textures and variations in tones to come up with unique compositions. Ableton Live Lite 8 Fender Edition recording software – The Ableton software provides the convenience of recording in your own home studio as you practice and experiment with different amp models and digital effects. It is compatible with both PCs and Macs and you can easily plug-in your computer to the combo amp’s USB port. Portable – The compact, lightweight amp constructed with black textured vinyl covering and silver grille cloth is ruggedly built for use in any location. It is equipped with a ¼-inch instrument input and 17 amp models to choose from and can be adjusted and tuned to provide a variety of sounds. Excellent sound – Its features include built-in digital effects like tremolo and reverb, 20 watts of power and an 8-inch Fender Special Design speaker. Versatility – The guitar amp is suitable for home practice and is sufficiently powerful with a great sound for use with small audiences. The FUSE software provides plenty of features for creating your own library of presets with the inclusion of effects like tremolo, phasing and reverb. With its USB connectivity and accompanying software, amateurs can practice, compose and record tracks of their performance. Some users encounter difficulties in the use of the FUSE software and the learning curve can be very steep, specifically in creating and saving presets. The Fender Mustang I V2 20-Watt 1×8-Inch Combo Electric Guitar Amplifier with its FUSE software is a portable, great-sounding amp with 17 models and a channel for presets that you can use reliably for practice sessions, small gigs and private recordings. The Line 6 Spider IV 15 15-watt 1×8 Modeling Guitar Amplifier is a versatile modeling amp equipped with an 8-inch speaker powered by 15 watts. You can use it for practices, amateur recording and small performances with confidence that the dialed-in amp models and special effects will produce the rich tones and sounds for playing in any genre. For special performances, you can edit and tweak the amp models and save as many as 4 customized presets in the channel’s memory. Excellent construction and design – The amp uses 15 watts power and is equipped with an 8-inch custom speaker that supports loud volumes for practices and performances in small venues or the outdoors. In combination with the three-quarter closed-back cabinet, the amp delivers exceptional sounds with clear definition. Clean, Metal, Crunch, and Insane amp models – The 4 dialed-in amps were mastered by professional players to provide world class tones that support playing in any genre. You can edit the amps or include special effects to create up to four customized presets and save each to a channel memory for your special performances. Versatile – The amp is packed with features that support playing in any genre. The four dialed-in amp models include the clean tones that simulate a 100-watt Marshall Plexi and the mean and popular Insane that is loaded with distortions. The amp is lightweight, well-built and portable, so you can take it with you for practices, amateur recordings and performances. Easy to use – The amp features a built-in tuner and an FBV foot controller jack that supports standard foot pedals for the easy switching of channels. The Smart FX knobs on the front panel are easy to reach for making adjustments on the fly, while the channel volume knob quickly balances the volumes of the presets. Excellent sound- The spider IV has a built-in tuner integrated into the front panel to ensure that the best sound is produced even without an external tuner. Sound quality is ensured by the tight and punchy response provided by the perfectly-tuned three-quarter closed-back cabinet. The amp is packed with features for creating great sounds but the learning curve can be steep. The user manual does not offer much help for the optimized use of these features. The Spider IV is a feature-packed modeling amp that allows you to choose and match dialed-in amps with special effects to support playing in any genre, from metal to rock or country and blues, or any other style that you choose. The Roland Micro Cube Guitar Amp is small yet packed with features that produce good tones and amazing sounds. Its excellent performance, ease of use and affordable price make it a favorite among beginners who like to take it around with them to practice or play with friends. As a practice amp, the Roland Micro Cube with its 6 DSP effects and 7 COSM amp models packs a punch and is the ideal companion for guitarists on the go. Single channel amplifier with 5-inch speaker – For a small amp with 5 watts of power, it is sufficiently loud for practice sessions, recording and experimentation. It is small yet ruggedly-built and produces great tones that compare favorably with those from more expensive and powerful speakers. 7 pre-amp settings and 6 DSP effects – For such a small amp with 5 watts power, there is a wide selection of amp models to choose from, including the choice of appropriate digital effects to harmonize with each model. The sounds are good simulations of the emulated amps and the clean tones and distortions are clear. Runs on battery or AC power – The ability of the guitar amp to run on battery power is a convenient feature, particularly when touring or travelling to a venue. Easy to use – The amp has simple features and controls that do not require adjustments. To produce good sounds, all you have to do is plug it in, choose an amp and the accompanying effect, adjust the drive and volume and you’re ready to go. Versatile – The features include 7COSM amp models and 6 DSP effect. The clean tones and distortions are great, and there is sufficient variation in the selections to give the correct tones and sounds to performers on the go. Inexpensive – The Roland Micro gives good value in terms of versatility and usability. Its minimalistic design is user-friendly and there is sufficient variety in the choice of amps and effects. The 5-inch speaker has enough power to give a loud volume for practice sessions and playing to small audiences. The 5-inch speaker is loud enough for practice and playing to a small audience, but is not quite loud for jamming with other performers. The Roland Micro Cube with it 5-inch speaker, digital effects and selection of amp models is a small-sized guitar amp that is very usable for practices, small performances and playing on the streets. The FIRST-ACT Practice size guitar amplifier MA104 is a simple, easy to use guitar amp that combines functionality with a budget-friendly price. The amp is equipped with a 4-inch speaker with sufficient power and volume for practice sessions, and is also suitable for jamming with friends. It has a gain control knob that produces cool distortions, while the volume and tone controls are easy to balance to produce excellent sounds. 4-inch speaker – Though small in size, the speaker provides excellent clarity and projection. It is ideal for practice sessions in your home studio and for jamming with friends, and with proper adjustments and balancing, it sounds as good as an amp with a bigger speaker. Simple and durable design – The MA 104 is ruggedly built with a cool and retro design, with the control knobs located on the front panel. 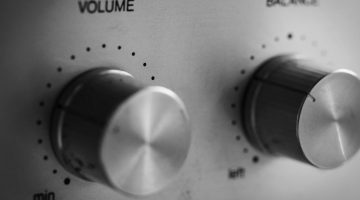 There are only three control knobs to consider – the volume control knobs on one side, and the tone and gain control knobs on the other side. The input jack is located in the front panel, right beside the volume control knob. Variable gain, volume, and tone controls – It is the simplicity of the construction and design of this practice amp that makes it easy to use and ideal for beginners. There is are no numerous knobs to twist, turn and balance, but the sounds are varied enough for playing in various genre such as jazz, rock, and country music. Easy to use. The simplistic, retro design with just a few knobs to fiddle with makes this an ideal practice amp for beginners. The gain control makes clear distortions and it is easy to balance the tone and volume controls to create good sounds. Portability. The practice amp is extremely lightweight at 4.2 pounds and its compact build that measures 8.2 x 5 x 8.8 inches means you can easily take it with you for practice sessions and small gigs. It is ruggedly-built enough to withstand being moved around and it looks fine on the stage with its retro look. Price. The guitar amp has a budget-friendly price that is not hard on the pocket. It is a good investment for improving your guitar playing. The practice amp is good for playing at lower volume settings since at higher settings for volume and gain control, the quality of the sound deteriorates. The FIRST-ACT Practice size guitar amplifier MA104 is a wise investment for budget-conscious players who require an easy to use and portable guitar amp that delivers good-quality sounds.